As we've said, Google Now is one of the most notable new features that the Jelly Bean Android release brings. In the simplest of terms, it is Android's version of Siri for iOS, but much more integrated into the operating system. Google Now is way quicker than its competitor at recognizing and answering your queries and after its most recent update is probably the best voice assistant currently available on the market. It can now launch apps, schedule appointments and check what you have next on your agenda, so it matches the competition in terms of functionality and even exceed it in certain areas. Besides being able to recognize voice commands, Google Now will learn from your usage patterns, and display relevant information. For example, if you search for a particular sports team frequently, Google Now will display information for upcoming games you might want to watch and past results you might want to know. Going to work in the morning? Google Now knows this and lets you know there's a big traffic jam on your usual way to the office, and will offer you an alternate route. The service interacts with you by generating cards which are displayed on your screen and give you a short overview of information it believes is relevant to your query.This extends to a multitude of other areas, including weather, traffic, public transit stations, and nearby points of interest. To activate Google Now on the HTC One X+ you need to press-and-hold the Home button. You can either type in your queries or simply speak to it and the assistant will give you one of its aforementioned info cards (if available) and read its contents aloud (you can disable this from the app settings). If there's no card to help with the answer to your question, Google Now will simply initiate a Google web search instead. 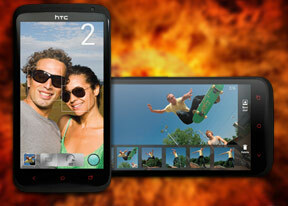 HTC One X+ runs on a slightly speedier version of the chipset that powers the One X. Instead of NVIDIA's Tegra 3 T30, the One X+ uses the Tegra 3 T33. There are two major differences between these two quad-core boards - the T33 CPU works at 1.6GHz in multi-core mode and 1.7GHz when only one core is enabled (200MHz higher than the T30) and offers a higher RAM clock speed. The difference doesn't sound like much, but our benchmark tests showed that the One X+ is notably speedier than its predecessor. Of course, the Jelly Bean OS and the optimizations it brings should take some of the credit as well. The One X+ topped all other quad-cores on the market in the single-core Benchmark Pi test. Even more impressively, the gain over One X is notably bigger than the difference in clock speed suggests. The One X+ performance in the multi-threaded Linpack wasn't as inspiring. The latest Exynos chipset inside the Galaxy Note II managed to beat the One X+ score, but neither of those was able to come anywhere near the quad-core Krait processor powering the Optimus G.
We also ran the Quadrant benchmark, which tries to evaluate the overall processing power of the chipset - CPU, GPU and memory performance. The One X+ managed to come on top here, which is a really impressive achievement. The 3D graphics department is handled by NVIDIA's own GeForce GPU. Here the One X+ showed pretty big improvement over the One X, but couldn't do anything against the newer generation graphics processors. AnTuTu is another all-round benchmark. The One X+ leveled with the Galaxy Note II champ here, topping everyone else. The BrowserMark score also came up pretty impressive, suggesting that the HTC One X+ has one of the speediest web browsers around. So, despite using an older generation chipset, built on 40nm process the HTC One X+ proved that it's one of the fastest phones on the market today. The updated Tegra 3 makes a noticeable difference, and while the GPU isn't as good as on some competitors the overall performance is nothing short of excellent.